With his appointment in 2010 as Organist of the Royal Chapel at the Palace of Versailles, Jean-Baptiste Robin (b. 1976) secured for himself a place in a long line of royal organists, such as François Couperin, Louis Marchand, Louis-Claude Daquin, and Claude Balbastre, as “court musician” of that world-renowned building. 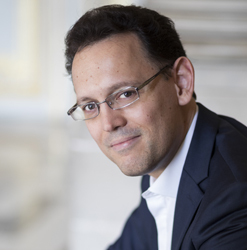 Widely regarded as one of the most prominent and accomplished French organists, composers, and master teachers of today, Jean-Baptiste Robin also serves as Professor of Organ and Composition at the Conservatoire à Rayonnement Regional in Versailles. From 2000–-2010, he was Organiste Titulaire of Poitiers Cathedral where he presided over the famous Clicquot organ. His numerous U.S. concert tours have yielded recitals in nearly half of the fifty states, including those at Woolsey Hall at Yale University, the Cathedral of St. Paul in Minneapolis, St. James Cathedral in Seattle, the Cathedral of the Madeleine in Salt Lake City, and Walt Disney Concert Hall in Los Angeles, among many others. He was a featured performer at the 2010 national convention of the American Guild of Organists held in Washington D.C. In Europe, Jean-Baptiste Robin has performed in international festivals in Haarlem, Toulouse-les-orgues, Masevaux, Saintes, Madrid, Montserrat, Bonn, Dresden, Freiberg, and Timisoara, among many others, and in famous European cathedrals in Cologne, Geneva, Porto, Monaco. In France he was invited in famous churches like Notre Dame, Saint-Sulpice, and Saint-Eustache in Paris. He has also performed at the Sejong Cultural Center in Seoul, Korea, the Mariinsky Theater in St. Petersburg, Russia, the Musashino Civic Hall in Tokyo, Japan, and the Forbidden City Concert Hall in Beijing, China. In 2018 he will give two organ recital tours in China. As a master teacher, he was a distinguished artist-in-residence at Yale University and at the International Summer Academy for Organists in Haarlem (Holland), has taught numerous masterclasses for the American Guild of Organists, the Korean Guild of Organists, Beijing Central Conservatory of Music, and numerous universities and conservatories in the U.S.: Washington University (Seattle), Lawrence University (Wisconsin), the Cincinnati College-Conservatory of Music, the Oberlin Conservatory of Music (Ohio), University of Michigan, St. Olaf College, and University of Oklahoma. He teaches for the Royaumont-Versailles Seminar and each year for the Poitiers Summer Academy. He served on the jury of the 2017 Canadian International Organ Competition in Montréal. Robin has composed over 50 works ranging from those for solo instruments to symphony orchestra, and his works have been performed by various ensembles such as the Orchestre National de France, the Philharmonia Orchestra, the Maitrise de Notre-Dame de Paris, and the Ensemble intercontemporain under the batons of Pierre Boulez, Roberto Fores Veres, Laurent Petitgirard, and Jean Deroyer. He has collaborated with frequently with François Salque (cello), Xavier Phillips (cello), David Guerrier (trumpet), Romain Leleu (trumpet), and numerous organists such as Isabelle Demers, Thomas Gaynor, and Todd Wilson. He received a commission in 2010 to compose a work for the Ensemble intercontemporain by Pierre Boulez in celebration of Boulez’ 85th birthday. His organ concerto was performed at the Victoria Concert Hall in Geneva and the National Centre for the Performing Arts in Beijing. This work was awarded Grand Prix Lycéen des Compositeurs in 2018 by Radio France. He composed a new work for solo organ for the 2018 national convention of the American Guild of Organists in Kansas City and he received a commission for the Symphonic Orchestra of Radio France for next April 2019. Jean-Baptiste Robin studied at the National Superior Conservatory of Music in Paris, winning seven Premier Prix and two post-graduate diplomas in theory and organ performance. He studied the organ with Marie-Claire Alain, Olivier Latry, Michel Bouvard, and Louis Robilliard, and composition with George Benjamin at King’s College, London. In addition to his well-known performances of classic and romantic French organ repertoire, he is also considered one of the great performers of the American Symphonic organ repertoire and is admired for his transcriptions and kaleidoscopic registrations, as evidenced in his CD The American Symphonic Organ, recorded on the E.M. Skinner organ at the Cincinnati Museum Center’s Union Terminal (Brilliant Classics label). He has recorded the complete works of Jehan Alain (Brilliant Classics label), Felix Mendelssohn (Triton label), Louis Marchand (Triton label), and François Couperin (Naxos label), as well as his own compositions (Naxos and Brilliant Classics labels). These recordings have been consistently praised by music critics and have won numerous prizes in France and England, including several Diapason d'Or awards, Editor’s Choice by Grammophon, the Charles Cros Academy, and the Preis der deutschen Schallplattenkritik Vierteljahrliste. In 2017, Mr. Robin released a CD on the Brilliant Classics label of his own compositions for organ and various instruments entitled Fantaisie Mécanique, which a reviewer in Diapason (France) described as revealing “an evocative, extremely personal force.” In 2019 a new CD, Once upon a Time, recorded on the organ of the Walt Disney Concert Hall in Los Angeles will be released. Jean Baptiste Robin is represented in North America exclusively by Phillip Truckenbrod Concert Artists, LLC.